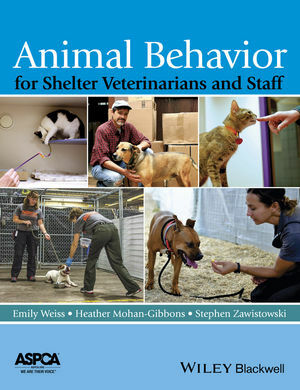 Animal Behavior for Shelter Veterinarians and Staff presents and evaluates the available research and programs that address both animal and human behaviors associated with the intake, management and rehoming of dog and cats. Emily Weiss, PhD, CAAB is Vice President of Shelter Research and Development for The American Society for the Prevention of Cruelty to Animals. She has been involved in shelter behavior for over 25 years. She has published numerous peer reviewed manuscripts as well as book chapters, and serves on advisory boards and committees of national shelter programs. Heather Mohan-Gibbons, MS, RVT, ACAAB is the Director of Research and Applied Behavior for the American Society for the Prevention of Cruelty to Animals. Her current work focuses on improving the lives of animals and reducing their risks in communities. For the past twenty years, she worked professionally with exotic and domestic animals in veterinary clinics, universities, federal and state governments, animal shelters, and her own animal behavior business. She has lectured extensively on animal behavior and has published several peer-reviewed manuscripts and book chapters. Stephen Zawistowski, PhD, CAAB is Science Advisor of The American Society for the Prevention of Cruelty to Animals. He is a certified applied animal behaviorist and chaired the Animal Behavior Society’s Board of Professional Certification from 1998-2007. He co-edited Animal Shelter Medicine (with Lila Miller, 2004) and the second edition in 2013.